Peachtree Publishing Company, 9781561459438, 32pp. Young Drasko is happy working with his father in the Sarajevo market. Then war encroaches. Drasko must run the family flower stand alone. One morning, the bakery is bombed and twenty-two people are killed. The next day, a cellist walks to the bombsite and plays the most heartbreaking music Drasko can imagine. The cellist returns for twenty-two days, one day for each victim of the bombing. Inspired by the musician's response, Drasko finds a way to help make Sarajevo beautiful again. 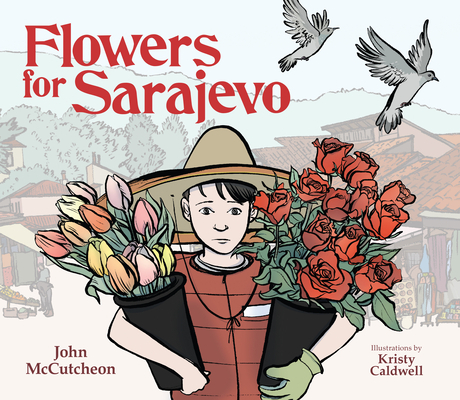 Based on real events of the Bosnian War, award-winning songwriter and storyteller John McCutcheon tells the uplifting story of the power of beauty in the face of violence and suffering. The story comes to life with the included CD in which cellist Vedran Smailovic accompanies McCutcheon and performs the melody that he played in 1992 to honor those who died in the Sarajevo mortar blast.